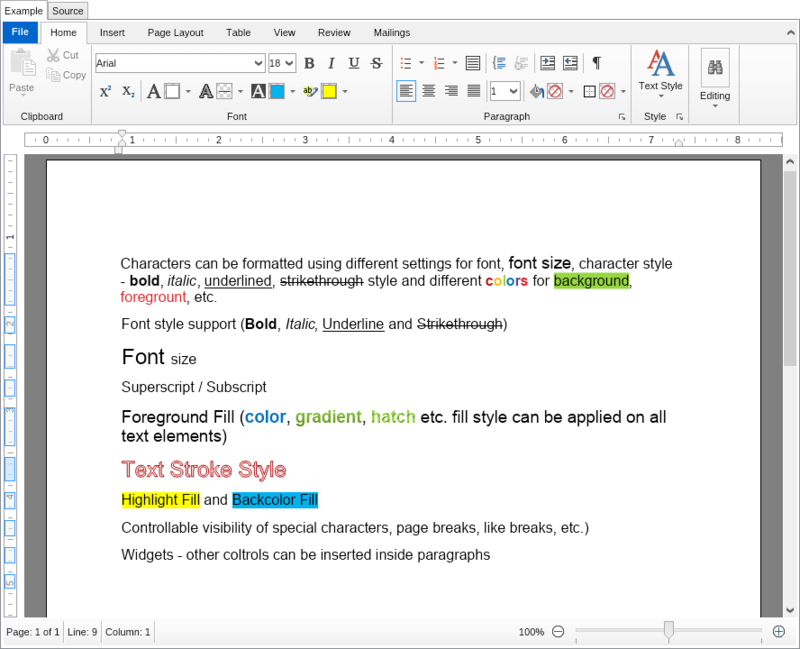 Characters can be formatted using different settings for font, font size, character style - bold, italic, underlined, strike-through style and different colors for background, foreground etc. 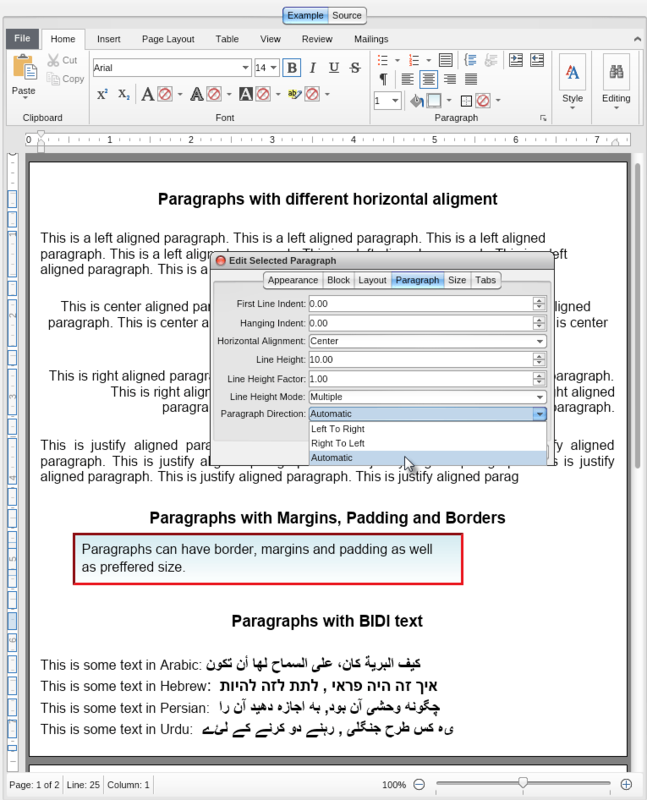 Paragraph formatting includes indentation, alignment, line height control, RTL support, tabs etc. Tabs – custom tab positions and tab alignment (Left, Center, Right and Decimal), tab leader styles. 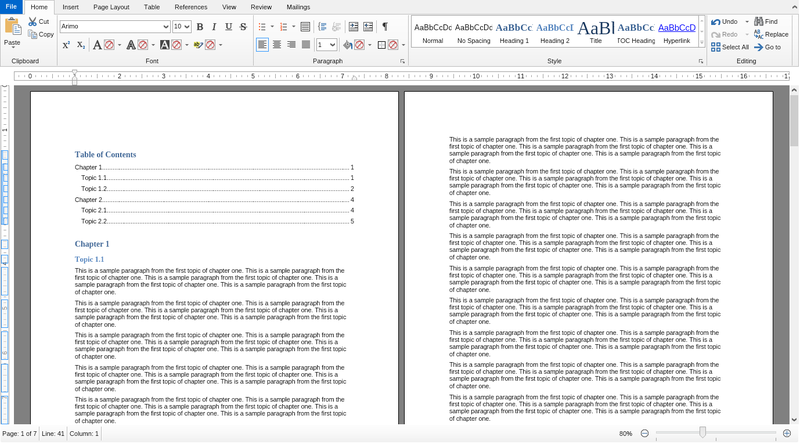 Paragraph Styles – predefined styles with support for editing and creating new ones. 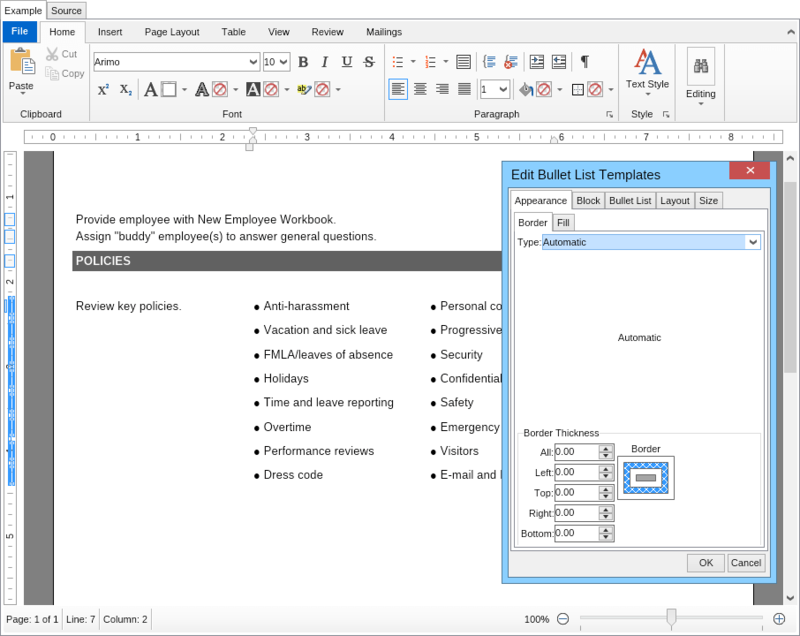 NOV Rich Text Editor supports numbered, bulleted and mixed multilevel lists. NOV Rich Text Editor provides advanced support for tables - you can nest tables, split and merge table cells, insert and remove rows, apply borders etc. Columns - Tables columns with Fixed, Automatic and Percentage width and custom specified appearance. 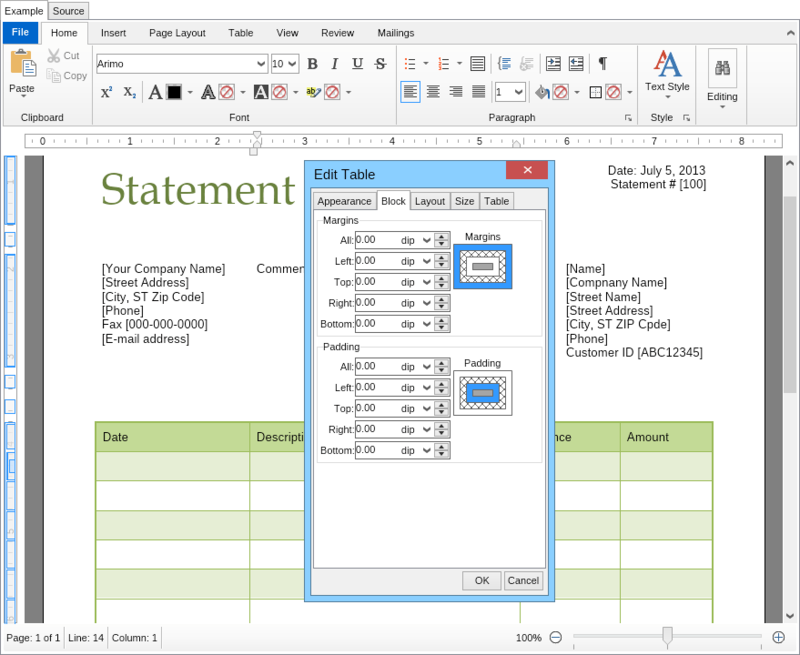 Rows – Table rows with preferred, min, max height and custom specified appearance. Row / Col Merge Cells – each table cell can be configured to span a range of cells in the table. Nested Tables – tables can be nested in each other. Table Borders – support for collapsed and expanded table border. 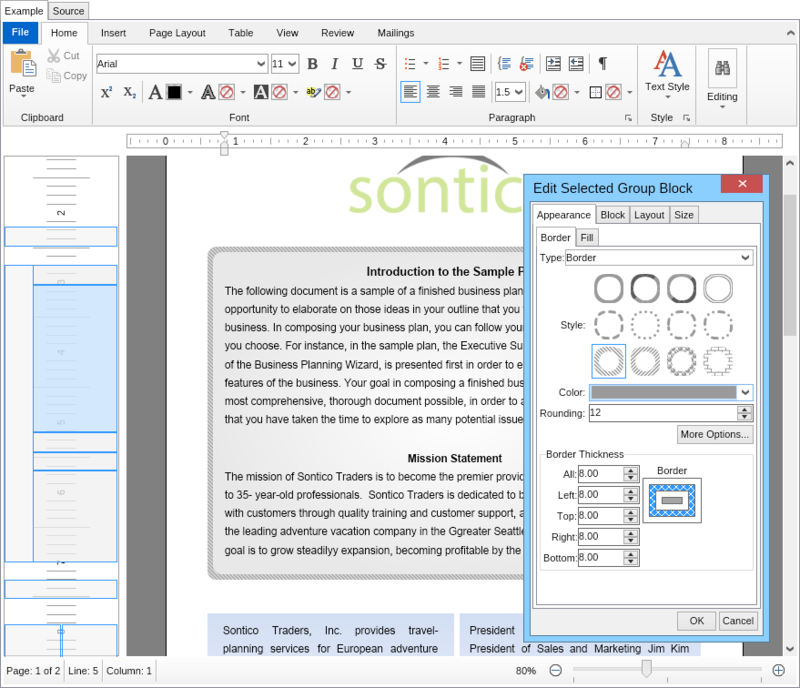 Ability to specify horizontal and vertical cell spacing. Table styles – predefined styles with support for editing and creating new ones. Headers and Footers – ability to specify headers and footer for first, even or odd page. Page Size / Orientation - page size and orientation can be specified per section. Columns – multiple columns per section with controllable column spacing. Column Separator – separator line between columns on the page. Section Breaks – Continuous, Even Page, Odd Page, New Page section break separators. Group blocks can reside in any block container and contain any other type of block. They provide a convenient way to group blocks together and are very similar to "div" elements in HTML. Floating blocks – all blocks (except table row and cell) support floating (Left / Right) and float clear mode. The table of contents block lets you easily create and maintain an up to date table of contents for a rich text document. Support for all commonly used numeric, string and date time such as page number, page count, current date time etc. 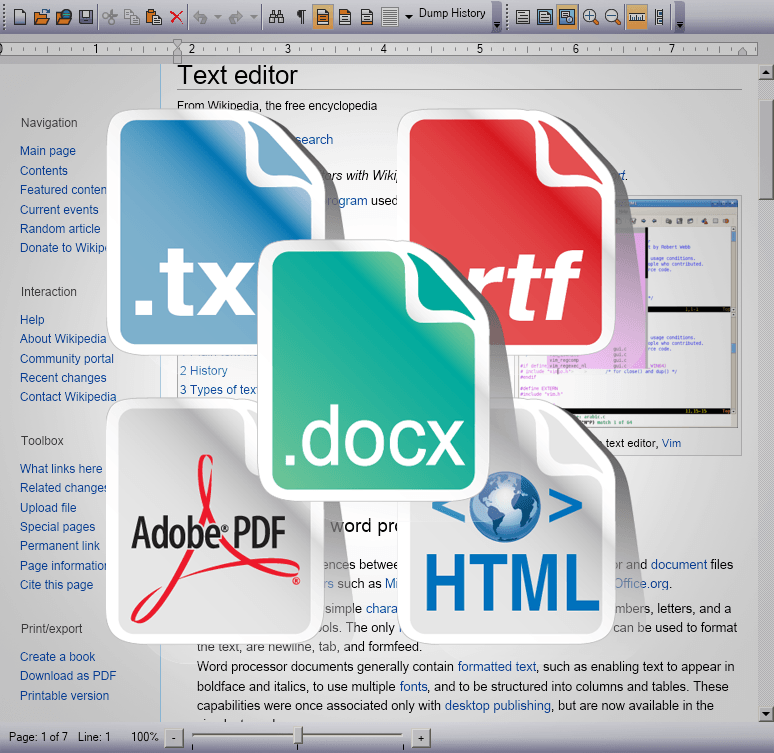 NOV Rich Text Editor for .NET provides support for hyperlinks and bookmarks. Hyperlinks allow you to associate a URL to text, which when clicked in a browser navigates the browser to a different URL. 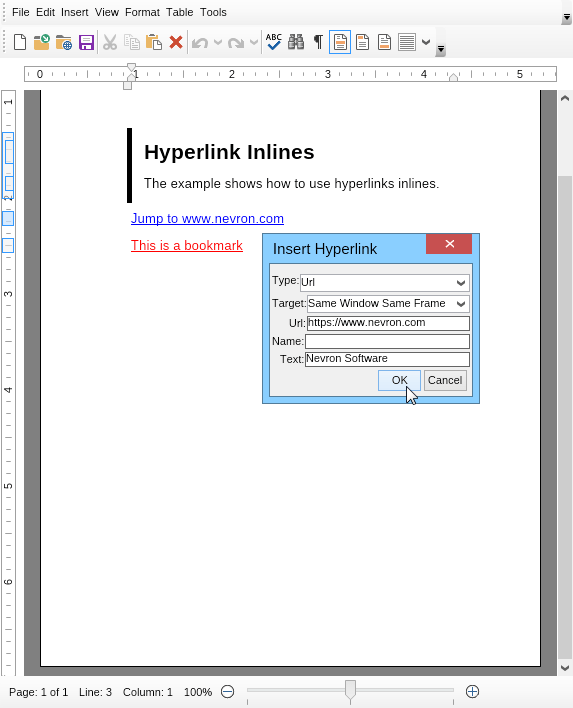 Hyperlinks can also be used as bookmarks. Extensive support for mail merge fields, greeting lines, field mappings, merge document generation and the most popular mail merge data sources - Access databases, Excel spreadsheets and CSV text files. Support for "as you type" spell checking as well as spell check suggestions. 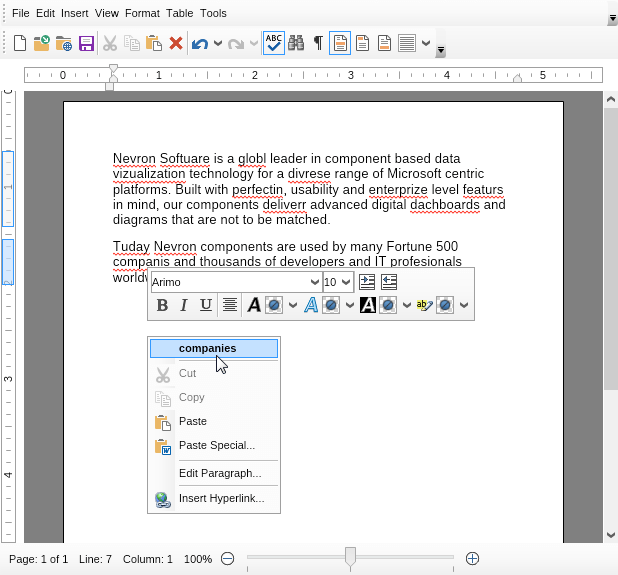 Ability to extend or modify the build in spell checker. Fast and reliable Spell Checking. Spell-as-you-type: when using the Spell Checker, it constantly checks spelling as you type, word by word, and as you copy and paste. Right-clicking on a spelling mistake presents a context menu with suggestions. Spell Check Dictionaries: NOV Rich Text is compatible with almost all Open Office spell check dictionaries. Support for BIDI (right to left) text and mixed text (Latin and Arabic). 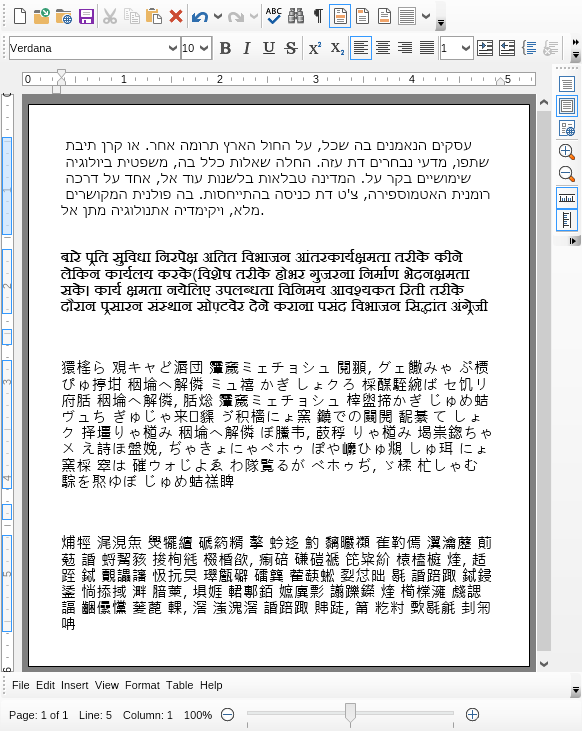 Export to PDF for text containing complex scripts such as Arabic, Hebrew, Indic and others. EMF and WMF image formats retain scalability when printed or exported to vector formats (PDF). Support for loading document from DOCX, RTF, HTML, EPUB (Electronic Publication), TXT, NTB (Nevron Text Binary) and NTX (Nevron Text Xml) formats. Support for saving documents in DOCX, RTF, HTML, PDF, EPUB (Electronic Publication), TXT, NTB (Nevron Text Binary) and NTX (Nevron Text Xml) formats. 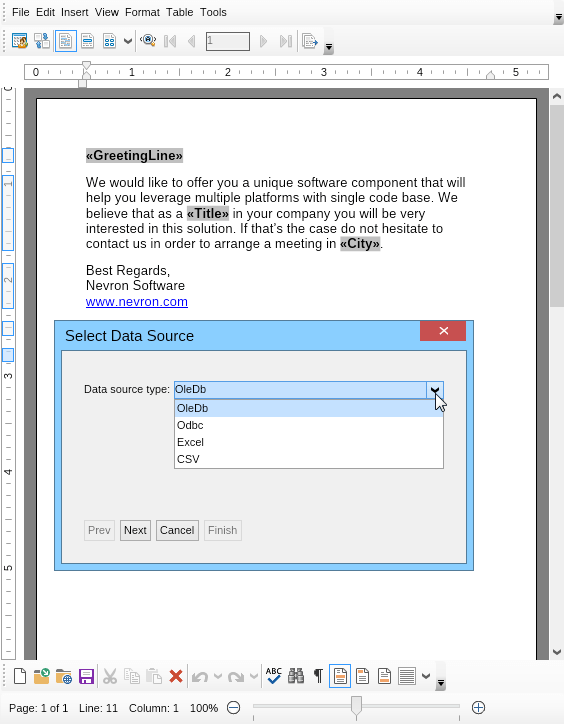 Nevron Text is a completely resolution independent text processor and supports true WYSIWYG printing without any difference in formatting or appearance. 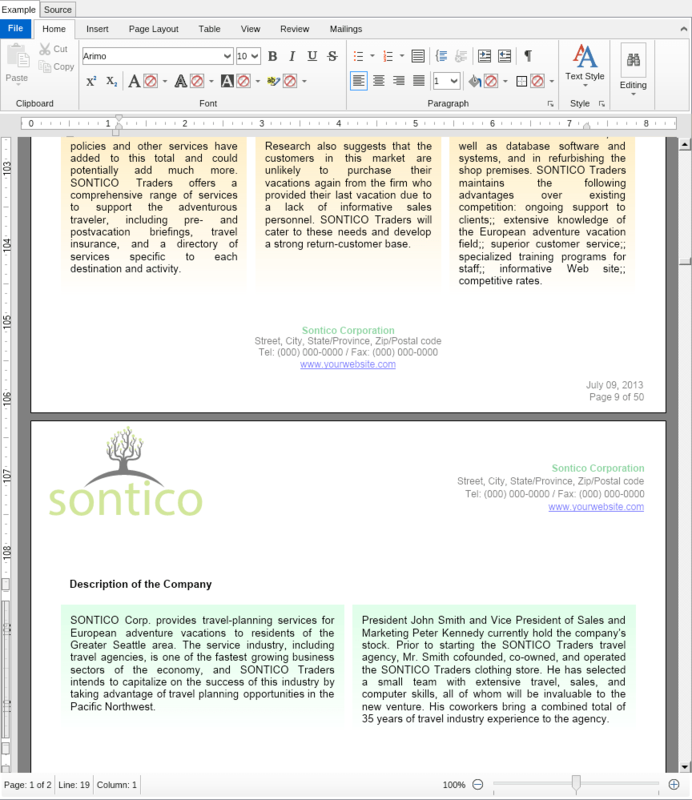 Printing of the current page, range of pages or the entire document. Printing of multiple copies of the document or range. 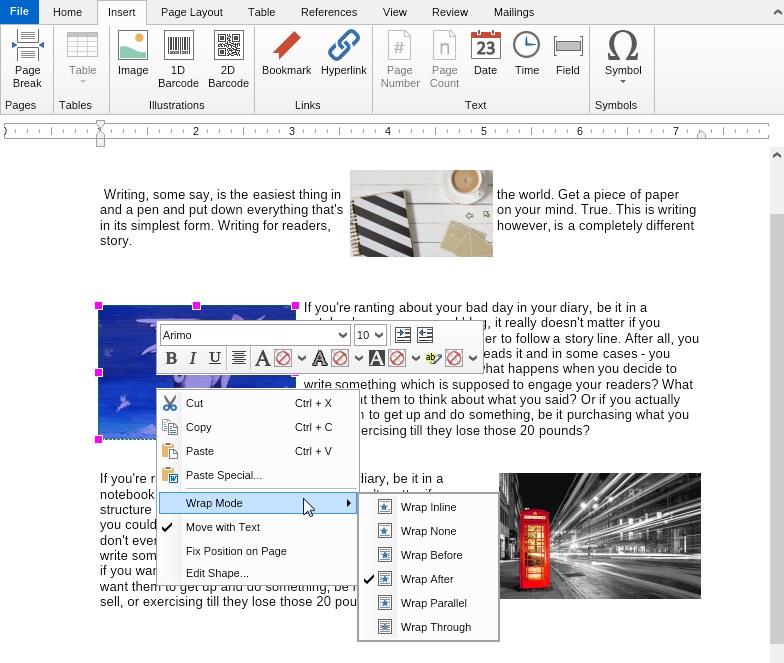 WYSIWYG - The control is completely device resolution independent – what you get on the screen will look the same way on any device (printer, pdf etc.). 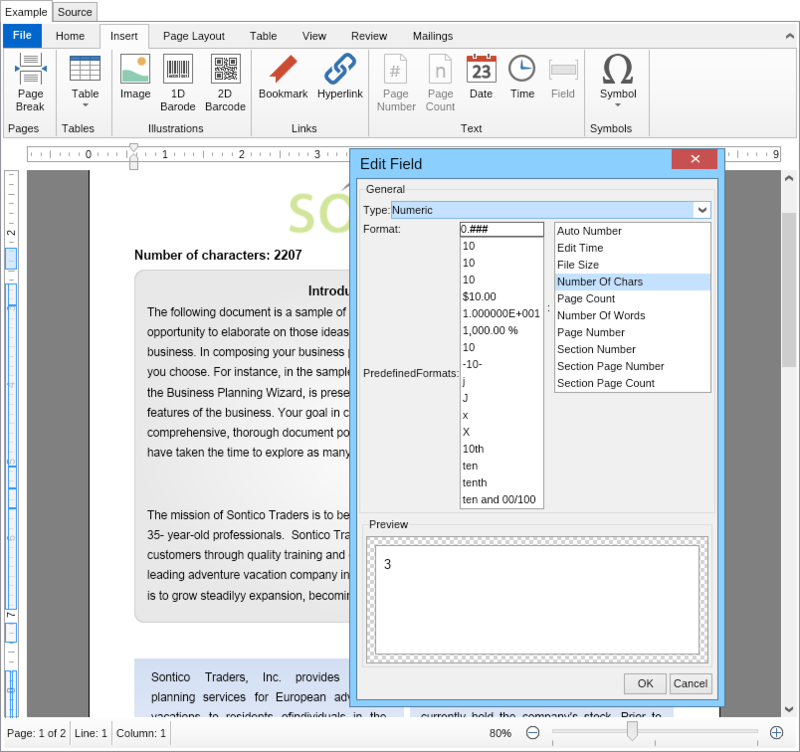 In place property editing - All formatting editors modify the text document in place, which allows you to quickly preview your settings. Characters formatting - font size, font style, font name, superscript, subscript etc. Find / Replace - Ability to specify different match options like upper/lower case, text normalization and search direction. 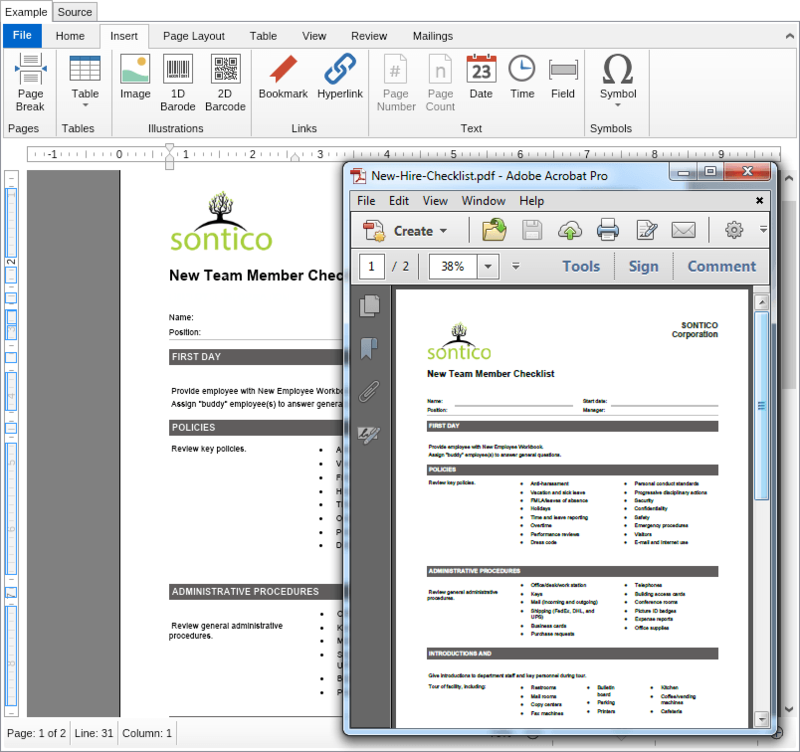 Goto - Ability to jump to different document parts (page number, line number etc.). Clipboard - the control supports Cut / Copy / Paste / Paste Special commands. Insert Breaks - line break, page break, section break, column break. Zooming - zoom in / out and free zoom slider. Performance – Nevron Text is the World’s fastest text processor and is able to process huge amounts of text. It can easily handle 1000+ page documents. The control is approximately five times faster than MS Word in both RTF import and layout processing speed. 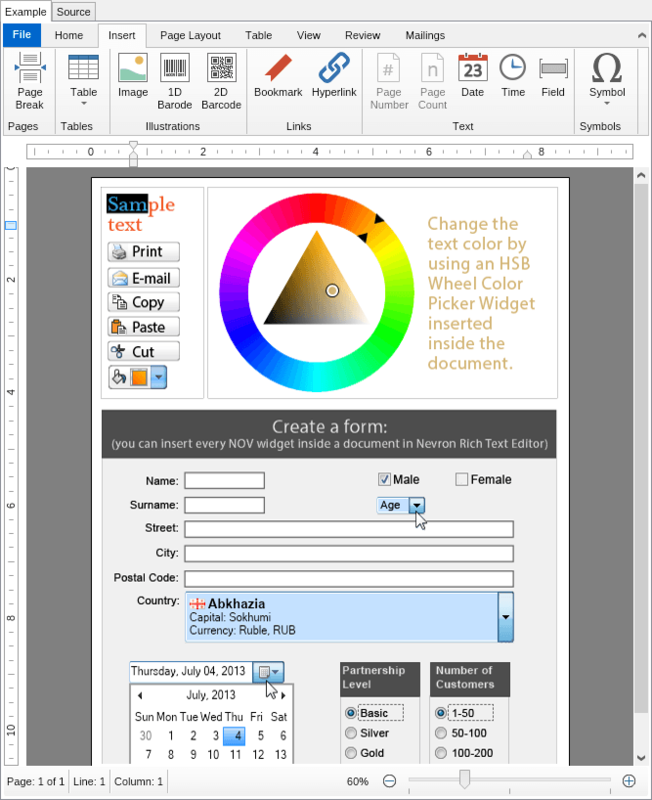 Presentation – the control features text processing features found in desktop publishing applications like the ability to apply images, gradients and stroke to all text elements (blocks, text, tables etc.). Open URL feature – the control can open URL with HTML directly, just like a browser. Paging Control – the control supports page formatting instructions at every level of the document tree including tables and floating blocks. This means you can insert page breaks inside table cells or floating blocks, which is not achieved by any other text processing program. Widgets – you can embed every other widget found in NOV inside the text content which allows you to build HTML like interfaces. 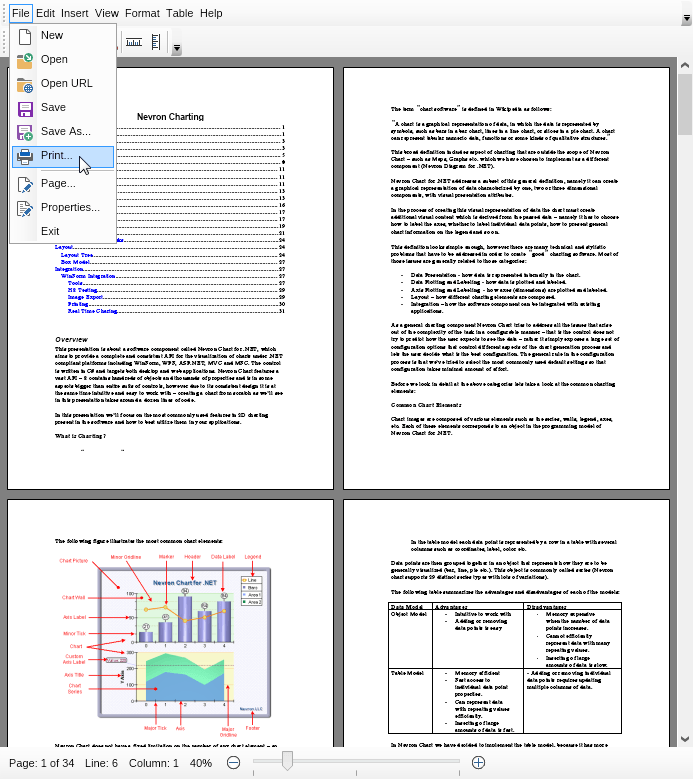 The Widgets can be persisted in text binary and xml formats (NTB and NTX), printed and exported to PDF.